I love this show its AWESOME! I lost it on the train and look like a complete weirdo. 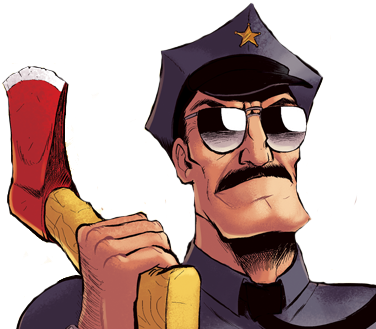 Thank you for axe cop. Yeah? I’m in my dorm and started laughing. Someone knocked on my door to make sure everything was alright. I am late to the world of AXE COP but I am glad I found it. I will definitely try to catch up. Better late than never. Thanks for checking it out. I recommend the books too. The even numbered volumes are not available on the web site. #2 is my favorite. Cool, thanks for checking out the site!